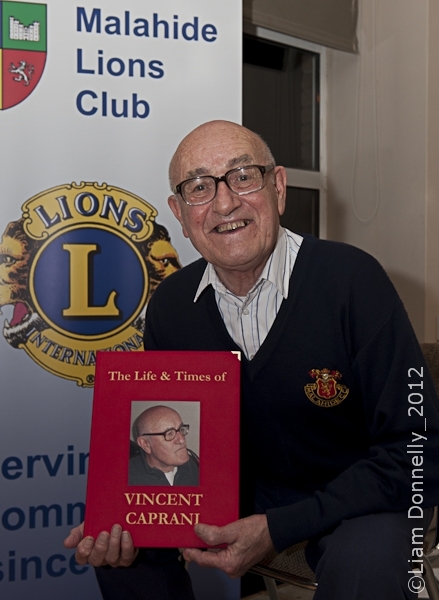 On Saturday 3rd Nov 2012, the local community, supported by Malahide Lions Club, paid tribute to one of their own, Mr Vinnie Caprani. Vinnie, as confirmed by many, is a man of diverse talent; a Dub, a poet, an author, an artist and a local historian of note. Where else could a becapped man be found wandering with a bag on his back, contaminating everyone with his crooked pipe, yet sharing his time and experiences with all and sundry whilst influencing a local enthralled Malahide populace. The evening of the surprise celebration centred on the proverbial Red Book of  This Is Your Life fame, and took place in the Malahide Tennis & Croquet Club. Mr.Paul Douglas, Vice President of Malahide Lions, delivered the opening address and introduced Seamus Dooley, Secretary of NUJ, as master of cermonies, narrator and interviewer. Many messages of good will and best wishes were received from some whom Vinnie befriended in his journey of life, including a very special message of support and friendship from our President, Michael D. Higgins. Seamus referred to Vinnie's  Rowdy Rhymes and Rec-im-itations ,  Bawdy Ballads and Ancient Airs and to  Dirty Doggerel and Sacred Songs before introducing other friends who entertained and enthralled the large gathering; critics, authors, Joycean scholars like Senator David Norris, Ulick O Connor and Des Geraghty to name some, who showed that Vinnie's contributions had spread beyond the borders of Malahide. To Seamus for his entertaining stewardship of proceedings and his fellow Princes of the artistic and literary world, Ulick, David and Des ,not to forget the true Dub Prince of Princes, Vinnie Caprani, our profound and sincere thanks. It is our pleasure and privilege for us in the Malahide Lions Club to know, to befriend and to be associated with such a tribute to one of our own, Menotti Vincent Caprani. In addition, Mr Concetto La Malfa of the Italian Institute spoke of the ancestral Italian family connection and the Italian influence on Vinnies artistic works not to overlook his pugilistic experiences and exploits reflected in  Nine-Ten-Out . As Seamus said, his gothic suspense novels  Polmarran Tower and  The Bride of Invercoe , written under the pseudonym of Charlotte Massey, have sold over a quarter of a million copies and have been published in the USA, UK, France, Germany and Scandinavia. Other works, historical, fact or fiction  The Wolves of Monte Neve and  The Spirit and The Heritage were researched in Florence, Rome and mountainy villages in Italy. But the most popular of all, Vinnies Rowdy Rhymes and Rec-im-itations' reflects the humour of the Dublin working class and owes a lot to the stories and yarns that he picked up years ago hanging about his Dad's barber shop in Moore Street. James Plunkett rightly places Vinnie in the tradition of Goldsmith and Zozimus and truly like James, Vinnie can belong to Strumpet City. Later in 1984 in his  A View from the Dart Vinnie provides amusing snippets referring to the passing land, the scenery and the people as viewed from the window between Howth and Bray and really set the scene for his other popular book  A Walk Around Dublin. Always a keen illustrator, in his retirement Vinnie discovered other talents of drawing and painting of depictions of his beloved Dublin architectural scenes, local beauty spots in Malahide and of course of his equally beloved Italy.